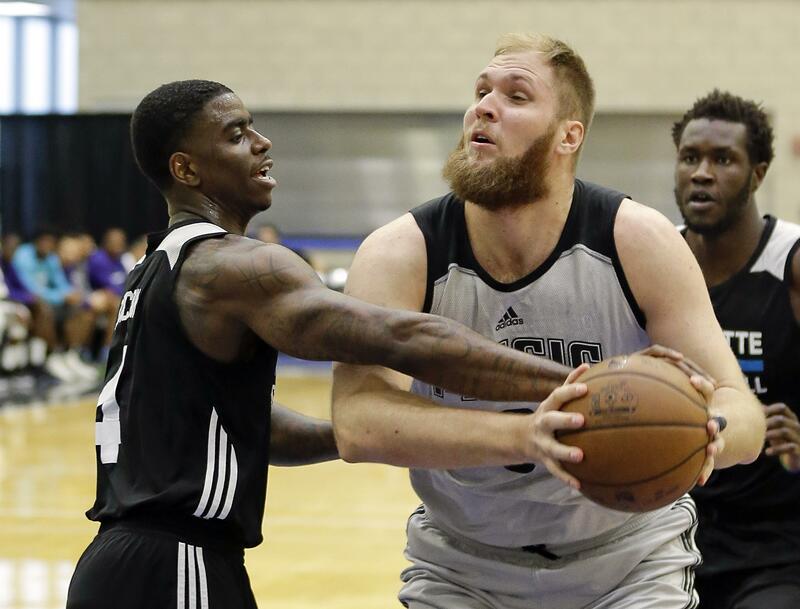 UPDATED: Thu., July 6, 2017, 4:18 p.m.
Przemek Karnowski’s NBA summer league experience didn’t go quite as anticipated but he made the most of unusual circumstances. The former Gonzaga center made the rare move of switching teams, bouncing from the Charlotte Hornets, where he was seeing limited playing time, to the Orlando Magic for the final two games. Karnowski had 20 points, nine rebounds and three assists Thursday in the Magic’s loss to the Hornets to conclude the Orlando summer league. The 7-foot-1, 300-pounder had 14 points and five boards in an Orlando victory Wednesday. It’s not unusual for a player to be with one team in the Orlando summer league and then join a different team for the Las Vegas summer league. It is unusual for a player to change uniforms at one summer league site. “We hadn’t seen that,” said Joe Smith, one of Karnowski’s agents at Wasserman. “The first few games (with Charlotte) he wasn’t playing very much and I think he got zero minutes in the third game, but he’s a great guy and was staying very positive and being a great teammate. Some labeled it a trade but Smith said it wasn’t technically the case because summer league players aren’t signed. Orlando needed frontcourt reinforcements after waiving center Stephen Zimmerman, a former high school teammate of ex-Zag Zach Collins, on Tuesday. Forward Johnathan Isaac, drafted by Orlando with the sixth pick overall, sat out the last couple games with a strained hip. It remains to be seen if Karnowski’s last few games lead to a training-camp invitation or a roster spot in the Las Vegas summer league, which opens Friday. He showed his soft touch around the basket, passing ability and basketball IQ by absorbing Orlando’s system in one shootarond. Karnowski certainly impressed Orlando summer league coach Chad Forcier. Published: July 6, 2017, 1:26 p.m. Updated: July 6, 2017, 4:18 p.m.